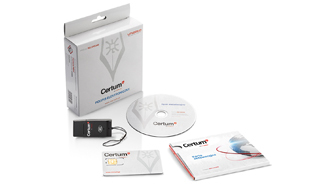 The CERTUM Standard suite without the reader for cryptographic smart cards is intended for clients who already have a reader. All you need for e-signature! Both suites include all elements necessary for e-signature: qualified certificate, cryptographic smart card and card reader. The manner of putting electronic signature, and the security level in the above-mentioned suites are the same. 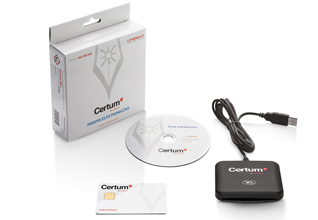 The CERTUM Mini includes a reliable mobile reader of a small size, in the form of a pendrive. It may be carried all the time and connected in different places outside the office. Thinking about clients who already have card readers, we developed suites without readers. 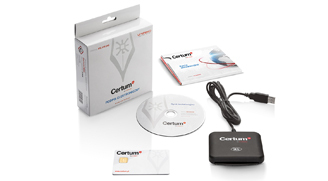 When ordering a given suite (CERTUM Standard or CERTUM Mini), choose the option: „no reader”. However, remember that for the purpose of electronic signature a complete suite with a reader is essential. If you have never used the electronic signature before and do not have an appropriate reader, choose a complete suite. Image of a reliable enterprise! What is an ID certificate? The ID Certificate is your electronic ID card, allowing you, among other things, to encrypt and sign e-mail correspondence. The use of CERTUM ID Certificates increases the reliability of enterprises and builds trust among their clients and business partners. Everything gets easier with e-signature! do you want to send a statement to the Social Insurance Company (ZUS) or Inland Revenue in an electronic form? You will need the electronic signature. The CERTUM suites are compatible with the Payer system and meet all requirements as stipulated in the act on electronic signature. It is a reliable and convenient solution. you can use the electronic signature for signing any type of corporate document and make them valid. Is it impossible to meet a client or contractor in person? Do you not want to waste time in offices? Sign agreements, invoices, statements, motions, forms, etc. 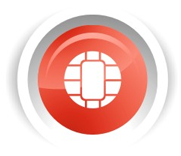 with the CERTUM electronic signature, and send them via the Internet in an easy and modern way. Why is CERTUM number 1 in Poland? 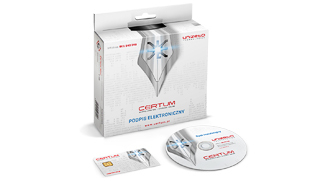 CERTUM is the unquestionable leader of certification services in the Polish market. We are the first Certification Authority in Poland entered into the register kept by the Ministry of Economy. We are the only Polish authority providing qualified certification services in compliance with the international standards WebTrustSM/TM. This means that the certificates issued by our company are recognized as trustworthy all over the world. 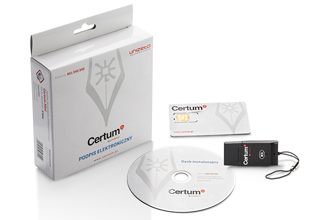 The CERTUM qualified certificate guarantees full security when signing all documents in an electronic form. Swoim klientom zapewniamy pełne wsparcie – począwszy od procesu zakupu kompletnego zestawu, przez jego instalację, użytkowanie, aż po dokonywanie odnowień certyfikatów. O Twój spokój i bezpieczeństwo dbamy 24 godziny na dobę, siedem dni w tygodniu. Do naszych konsultantów możesz się zwrócić o pomoc i instrukcje o każdej porze dnia i nocy. Wystarczy zadzwonić na infolinię lub skorzystać z chatu online. Żadne pytanie nie pozostanie bez odpowiedzi. ZFind our Partner in a convenient location and transfer your certificate to CERTUM in as short a time as 24 hours.